C&R Removals are based in Lincolnshire. We are a conscientious removal and storage business built on recommendation. We take every care of your home and property. 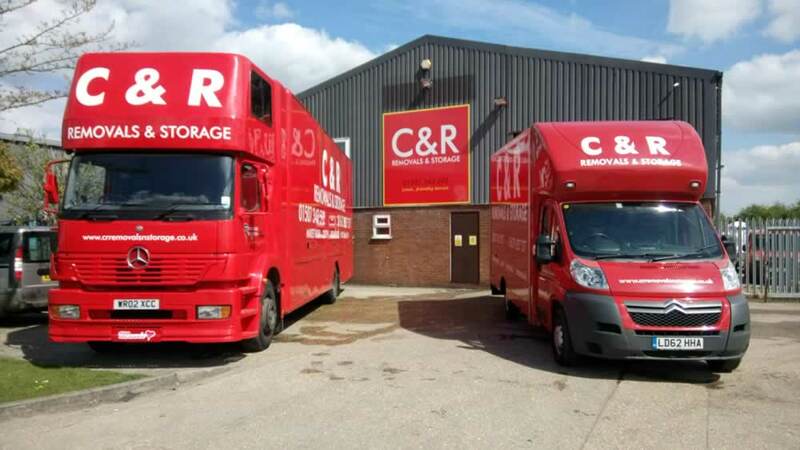 C&R are a house moving family business with many years of experience - we pride ourselves on good customer relations and attention to detail. Louth, Market Rasen & the Grimsby area. Moving is acknowledged to be one of the most stressful occasions in anyone's life. C&R aims to take the stress out of your relocation by providing a personal service. A personal consultant will oversee every stage of your removal from administration and transport to manpower. We will give you an honest appraisal when we quote you so that there are no nasty financial shocks further down the line. Thank you for your excellent services in removing us to our address. Danny and Chris went that extra mile to provide a hassle-free move! They are indeed excellent ambassadors for C&R and due to this we will continue to recommend your company. Very well done and thanks again. Well done Jim & Paul.. Re: Friday.When I told 1 of the 2 removers that "this is fragile please", he said "we treat everything as fragile for you", and that was very reassuring and professional I thought. Please thank the lads again for us - they were an absolute credit to you.Look forward to hearing from you soon. Thanks again. Thank you so much for your help in helping us move at the last minute. The team were fantastic and made the whole process stress free. They were very professional and friendly. I would certainly be recommending your company to friends and family. We have now unpacked all the boxes and are happy for them to collected from Monday. We are in all day Monday, Thursday and Friday next week. Hi Chris, Thank you so much for your help your team were great. To Chris and team...Thank you for making our moving day as good as it could be. The boys could not be better, they were hard working professional and very respectful to us. Nothing was too much trouble. Sheila and John Flynn, Braken Park, Grimsby. Sorry our email has been down - spoke to Chris in meantime. I just want to say that your lads were brilliant and their part in the proceedings went very, very smoothly from our point of view. We were very impressed with them and their organisational skills are second to none. I hope we never have to do this again but if we do then we will be in touch! Very best regards. Absolutely fantastic service from start to finish. Professional and friendly at every step of our journey from Lincolnshire to South Wales I cannot recommend this company highly enough. Just a quick email to officially thank you and your team for making our moving day run so smoothly. The lads were all cheerful and could not have done more to help. I would definitely recommend C&R. We have used C and R removals on several occassions over many years. We highly recommend them. We met Chis through his removal company and have stayed in contact with him ever since, as he is such a lovely person. He is always a pleasure to work with. He stays in contact through out the whole move. Jane is extremely pleasant and answers any questions I might have with such reassurance and knowledge, making the whole process a calm experience. All of the C and R men who have moved us have always been courteous to ourselves and respectful of our belongings. James in particular has moved us on various occasions and is always very polite, professional and cannot do enough to help. All in all C and R make what could be a very stressful time into a happy move. "Excellent service, attitude and competence"
I thought I would just write and say a big thank you to C&R for stepping in last minute and carrying out our move that had been on/off/on for so long. After the long, stressful time we had gone through it was really nice for us that we had a smooth move day. Your team were very professional and hard working and a real credit to your company. These days we are quick to complain but never credit a job well done. Once again a big thank you, and I would not hesitate to recommend your company to friends in the future. This was a very complicated move involving two households moving into each other's houses. The fact that it went so well is due in no small part to the great work by the crew. They were really helpful, kind and patient - I shall recommend them to anyone who wishes to move in the future! Want to peek behind the scenes? Contrary to public opinion the removal business is not all glamour... but it is fun. No SPAM – we promise to keep your email address safe.